For our latest contest, we've partnered with The Global Family Reunion -- a worldwide event taking place on June 6, 2015 to benefit Alzheimer's reasearch -- to find your best family recipes. 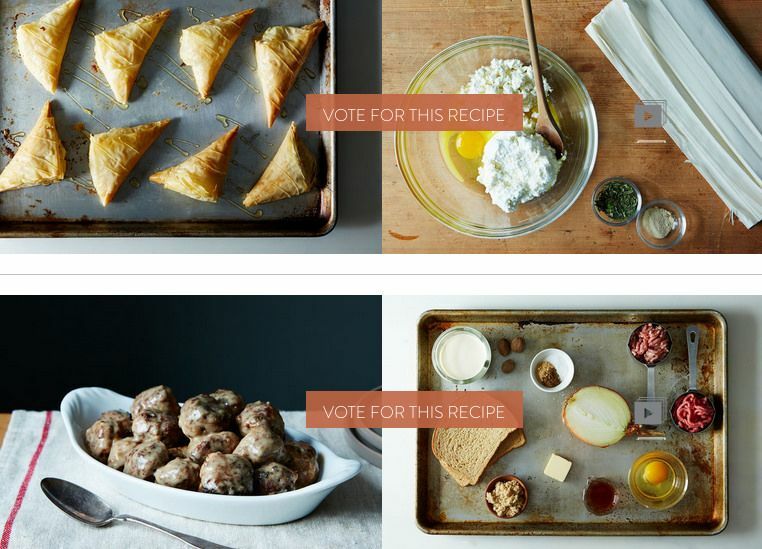 We've tested and tasted our way through the recipes for Your Best Family Recipe, Part 2, and have emerged with two promising finalists: Greek Style Cheese Pies (Tyropita) by Alexandra V. Jones and Old-School Swedish Meatballs by Corby. Here's where you come in: We want to know which finalist will win your vote. A little more about the first Global Family Reunion: This international event will take place June 6, 2015 in New York, with simultaneous parties around the world. All members of the human family are invited. It'll be family reunion meets a TED conference meets a music festival, with talks from Henry Louis Gates Jr., NPR's Scott Simon, comedian Nick Kroll, and with Sister Sledge doing a live rendition of 'We Are Family.' Morgan Spurlock will be making a documentary out of the event. All proceeds will go toward battling Alzheimer's. The Global Family Cookbook will be edited by Sasha Martin and Eowyn Langholf and designed by Tami Glatz. Head over to the contest page to cast it now!